In a world where most cars look much the same, the PT cruiser dares to be not just different but completely different! It was destined to be a classic right from its phenomenal USA launch in April 2000, when waiting lists of nearly a year led to some PTs changing hands at twice their original selling price. So, how did such a unique car come to be built in the first place? In the mid ‘90s the Chrysler Corporation had launched the Neon, a small saloon car that was designed to appeal to both International and US markets. It was decided that a tall, versatile car, like the Renault Megane Scenic, would make an ideal stablemate. This made sense for two reasons. Firstly, the tall car or small MPV (multi-purpose vehicle) was increasing in popularity in Europe. Secondly, in the US, Chrysler sell many large trucks and needed to produce a small truck-like vehicle to satisfy government regulations on fuel economy. A Plymouth badged Pronto concept car was shown to the public in 1997. It was a tall car with many practical features, a roomy interior and flexible seating. Apart from the Plymouth Prowler style grill, it was a modern design. European journalists liked the car, but those in the US were less enthusiastic about its styling. It was clear that the basic concept was right but that a more attention grabbing design was called for. Lengthy research and management debate led to the idea of a car that could somehow capture the 'Spirit of America'. A modern styling exercise wasn’t a success, so Chrysler bosses looked to combine modern practical features needed, with American car designs of the past. From the bold styling of the 1920s & 30s through to 50s & 60s hot rods. All that was needed was a designer capable of putting these ideas together. This is where Bryan Nesbitt, one of Chrysler's very talented young designers, comes in. He was, at the time a 27 year old graduate from the Art Centre College of Design in Pasadena. Bryan had been closely involved with the project from the start and was given a free hand to develop his ideas. His own research in Europe found that the car would fit into the popular MPV catagory. American styling would make it stand out as an import, hopefully giving it a measure of prestige. In the US, it was a completely different story. A small hatchback would have virtually no appeal, let alone any prestige. However, a truly original car could possibly make its own niche in the market place and attract buyers from a wide spectrum. Nesbitt took his inspiration from the 1930s era – high curvaceous cars with bold radiator grilles - mixed in the forward leaning stance of a hot rod and added modern touches like the headlights, windscreen and short body overhang to the front and rear wheels. At the same time he had to keep to the hatchback concept, which also involved a flat floor – necessary so that the ‘car’ could be classed as a truck to benefit the company’s official fuel economy quotas. His sketch here shows how close the original design was to the finished car. 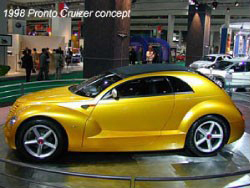 In 1998, a very stylish 3 door concept car, the Pronto Cruizer, designed by Nesbitt, was shown at the Geneva car show. Its purpose was to test public reaction and to throw Chrysler's competitors off the scent. It worked, and in 1999, the PT made a surprise launch at the North American International Auto Show. The PT Cruiser (PT for personal transportation) went on sale to the public the following year in April 2000. Built at the Toluca plant in Mexico, and for a period in 2002 at Graz in Austria, the use of innovative computer technology greatly reduced pre-production time and costs. On 10th July 2010 the final PT rolled off the production line in Mexico, and total worldwide production was 1.35 million units. 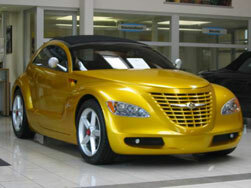 This unique car could not have been produced without some very bold management decisions at DaimlerChrysler. 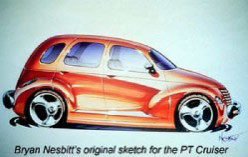 But most credit must surely go to Bryan Nesbitt, who not only designed the car and it's interior concept, but also came up with the name PT Cruiser. It is inexpensive, solidly made, well equipped and above all, fun to drive. The PT Cruiser has that quality very rarely found in cars nowadays – character.